Review: Is Personal Capital Better Than Mint? Editor’s Note: Ok not to make you guys jealous or anything but I’m now relaxing on the beautiful beaches of Naxos in the Greek Isles. Stay tuned for my honeymoon trip report where I’ll detail how I paid for about 2/3 of our hotel stays and flights using all the miles and points I’ve racked up over the years. Personally, I love Mint and I use it every day but the cool thing about PC is that it goes beyond your day to day transactions and budgets and it also delves into your investments too. It’s free to sign up too so check it out and let us know what you think in the comments. When it comes to excellent personal finance software that is free, there were not many options on the table for the past few years. In fact, Mint, was the most notable web-based financial management tool available in the past. The problem with Mint though is that it has its limits. It is lacking in the investment side of financial planning and is not best suited for individuals with complex portfolios. This is where Personal Capital steps in and fills the gap. Personal Capital was founded by Bill Harris, the former CEO of Intuit and Paypal. Harris has had his hand in several financial and security start-ups, but he considers Personal Capital as the culmination of his career. He developed Personal Capital as an answer to where financial services fall short. 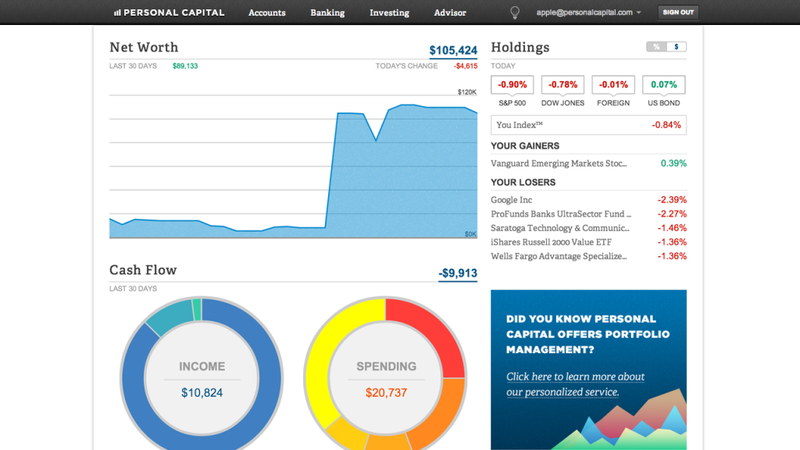 Through Personal Capital’s technology, individuals get a complete look of their finances. Even though Personal Capital targets clients with impressive investment portfolios, their free software can be used by anyone. Personal Capital is quite simple to use. You just sign up though their website or app. Then you link all of your banking accounts, debt accounts, mortgage, and investment accounts to your profile. This is actually a lot simpler and quicker than it sounds. As long as you have an online login for your account, then Personal Capital can link up to it within a minute. Of course, this leads to the big question. What about security? Personal Capital uses several layers of security to ensure your account safety. Any new device that you use to log into your account has to have an email or phone call confirmation. Signing into your account also requires a username, password, 6-digit pin, and photo recognition. Linking other accounts to your PC profile also requires username and passwords. They use military-grade encrypted algorithms to protect their site from fraud. Once all of your accounts are linked to your profile, Personal Capital lays out all of your finances very nicely with the use of different graphs and charts. It adds every account and debt together to give you your net worth. It then lays out your cash flow and your spending for the last 30 days. The transactions tab shows all of your recent transactions and automatically puts them in the correct category. Personal Capital then gives you a calculated total for each category. Personal Capital gives you a quick overlook of all your accounts at once, making it easy to spot ways to save money. Obviously, it is easy for individuals to identify ways to cut spending in their budget, since they can easily see where they are overspending. However, Personal Capital’s main agenda is to show clients where they are overspending in investment fees. Many individuals have found that they were paying too much in fees with their current 401K advisors and saved money by switching to a different investment company. This switch might not have happened if the information was not laid out in front of them just as Personal Capital does. It is hard to believe that such an impressive financial tracker is free. While the financial overview and tracking are free, Personal Capital makes their income through personal investment management. All of their services cost less than 1% of what individuals entrust to the advisors. For example, if one were to choose to have $1 million of their assets managed, they would be paying less than $10,000 a year. This rate is average among financial management services but you probably could get lower if you wanted to. The fee includes investment advice, portfolio management, custody and trading. Who Is Personal Capital Best For? The financial software can seem a bit intimidating with its target audience being high-end investors. Don’t be intimidated by this software, it is not just for financial big wigs. Individuals starting out with their finances can also benefit greatly from this software. PC makes it easy to get real-time updates of your budget and debt management. Hopefully using Personal Capital would encourage individuals in the beginning of their financial career to invest. Still, if investment is not in the cards for you, Personal Capital will surely win you over with their organized layout of your current financial situation. In the end, Personal Capital is an impressive financial and investment management software that tops similar software on the market. It is extremely user friendly and a wise tool for individuals with all types of financial profiles. Their paid services for investment management are on par with other financial management services, and if you take a look at their leadership team and board of directors, you know that they hire highly impressive people. If you’d like to sign up for Personal Capital using our referral link you may do so here. If you do end up signing up, please let us know so we can personally thank you and answer any questions you may have. I use the free side to PC for tracking and looking at details of my investments. It does have some nice features. There are some holes in their system where funds do not get classified or they are classified improperly. This has to do with some unique investments in some 401Ks and such that are not a standard ticker symbol on the open market or fund. This makes it near impossible for them to determine the allocations and investment strategy of those funds. I haven’t been able to work past paying the 1% management fee as well as them reallocating and managing my money within their portfolio umbrella. I’ve worked hard the last few years to shift most of my assets to Vanguard and my current company 401k as well as 2 old 401K but in Fidelity. It is challenging to balance % allocations across different account but I chose to keep my money where it is because the investments are good and have lower fees than I can find ANYWHERE else. This makes it harder to justify moving them. I didn’t like the fact that they completely ignored the fact that their software could not classify 19% of my investments within various accounts and at the same time they were extremely concerned with the fact that my portfolio contained 6% cash and that I need to invest that and know that down to 2-3%. All I could say was really I’m more worried about the 19% of my portfolio that you are not able to determine what its allocation actually is… My concern was not their concern. 19% of not knowing is going to skew my portfolio allocation way more than adjusting my cash from 6% down to 2%. If you do have the time listen parts of their sales pitch and presentation.. and watch for improvements to their software tool. Hey Tim, thanks for the awesome comment. I don’t know if automated programs like PC will ever be able to fully automate the 401 (k) analysis without cooperation from your plan administrator because there are so many unique funds like you mention. I have the exact same problem since all of my 401 (k) index funds from my old job and my new job are not publicly listed but they are super low cost and probably identical to Vanguard funds for example. So I suppose you could pick a Vanguard fund that will approximate your holdings? The problem with paying for financial advice is that you need to educate yourself enough to know what to look for in a good advisor. And once you’ve done that, you probably realize that it’s easier to just do it on your own. I call this the Catch-22 of financial advice. It’s not that hard to be a good investor, just drop your funds in a super low cost target date fund and never touch it or drop it in a US index fund, Int Index Fund and Total Bond Market and never touch it. But knowing how/why to do that is the major hurdle. I use the free side of PC too and I love it. It breaks everything down for us and show us exactly what we need. I don’t have the issue of unclassified securities, but I think that is because my 401k is with Schwab and the investments are special versions for 401k plans. I am always a bit hesitant to post my userID and PWs on a financial site for them to connect. Remember, any encryption algorithm is only as safe as the fastest computer. As processing speeds continue to increase, even 256 bit encryption will be easy to hack. I just assume that I will be hacked one day and take an active approach to protecting my financial accounts. Sign up with a bunch of free credit monitoring services, stagger my 3 free credit reports and check all my accounts and transactions using mint once a day.